Your request will go out to all GOABC members. Outfitters who have available openings will contact you. Compare the information received from the outfitters and book your dream hunt. To make it easier to keep up with our outfitter directory and the hunt finder listings we have moved the listing form and directory to our home site www.goabc.org. 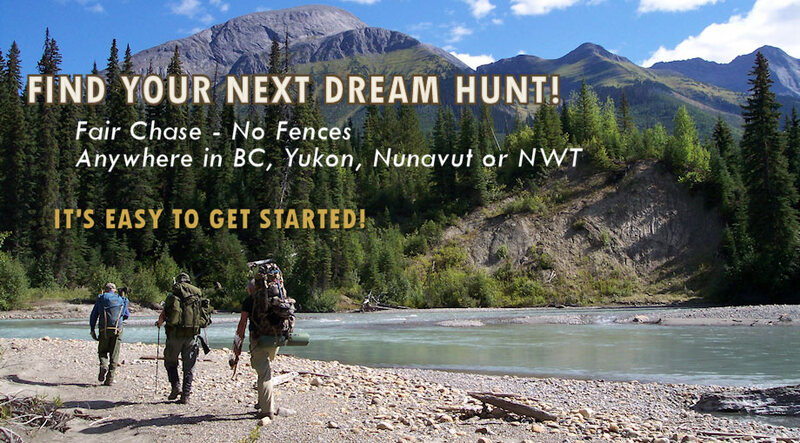 Hunt Finder™ connects hunters with quality guide outfitters from BC, Yukon, and Northwest Territories. By entering the details of your next dream hunt in GOABC’s Hunt Finder™ an email will automatically be sent exclusively to all of GOABC’s guide outfitter members. Our members will then contact you directly with a hunt that fits your requirements and the best part is that Hunt Finder™ is completely FREE! We make it easy to find the hunt of your dreams without you having to search through multiple listings. If you prefer to shop for your own guide-outfitter or if you are looking for contact information with a guide outfitter you have hunted with before, you can easily find our members in the Outfitter Directory on GOABC.org. You can search by name, region or hunting species.